Welcome to Laureal Maltese of Bridgeport, Michigan. The American Kennel Club Maltese Dog Breed is a playful fun loving dog breed and they are very loyal and are known to love everyone. My dogs are bred for my pleasure and for competition in confirmation first and foremost. In order to compete, I breed only from my best. In combining top winning kennels and top producers in the country, I have obtained many personal goals in my breeding program. In my breeding program at Laureal Maltese I strive to build and improve upon each breeding. 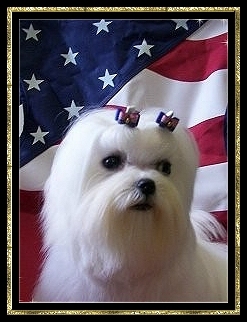 I always keep in mind the American Kennel Club Maltese standard. I put the utmost importance on temperament; along with that in mind I make sure of Maltese structure that I can win with and produce from. All of these things make a great show dog and also a wonderful companion Maltese puppy. My goal, in breeding is to breed as closely to American Kennel Club Maltese standard as possible for any and all Maltese puppies or Maltese dogs that are produced and shown here in AKC confirmation. While breeding with these goals I produce gorgeous show quality Maltese, however I do have Maltese puppies that are for sale to the right homes. Finding a Maltese Dog for sale is a very special time we hope to provide a wonderful well adjusted Maltese puppy for a lifetime of enjoyment. Occasionally we may have a grown Maltese Dog that is being retired to a forever home. Angela and Larry Stanberry of Divine Maltese, Jeanne Hess of Sunncrest Maltese, Barbara Bergquist of Su-Le Maltese have been of great influence to me and have been mentors as well. My breeding foundation has been a combination of many of years of breeding from these wonderful bloodlines. I am an A.K.C. Maltese Michigan Maltese breeder and American Maltese Association member in good standing. I was a previous Vice President of the Maltese Club of Lower Michigan as well.